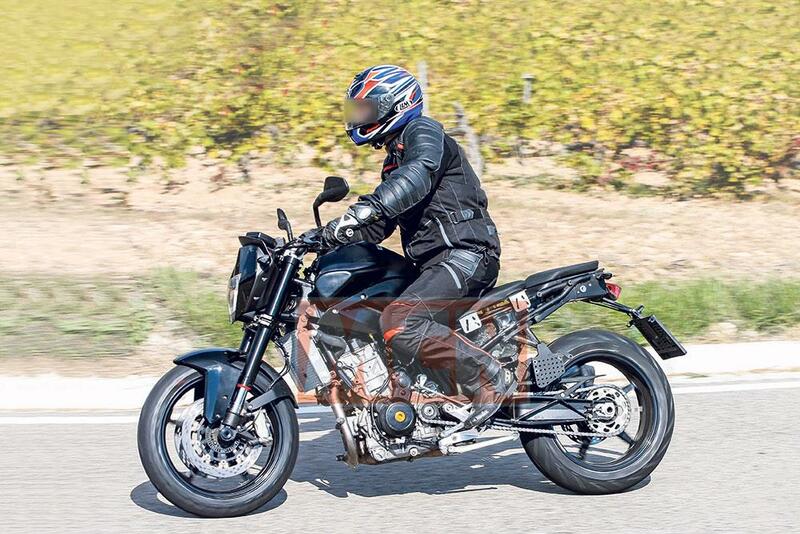 KTM’s upcoming parallel-twin has been spied testing – and official word from Austria has now confirmed a family of middleweight bikes will stem from this all-new 800cc engine layout. The first of this new batch of motorcycles will be the naked 800cc Duke which will be launched in finished production trim later this year at either the Cologne or Milan motorcycle shows. 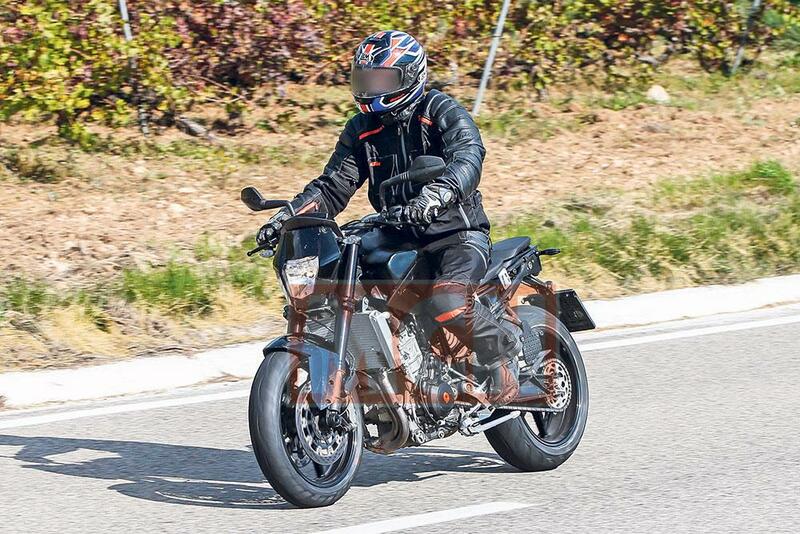 This Duke, along with an updated 1190 Adventure model, were spotted being evaluated on the road near KTM’s Spanish test centre. 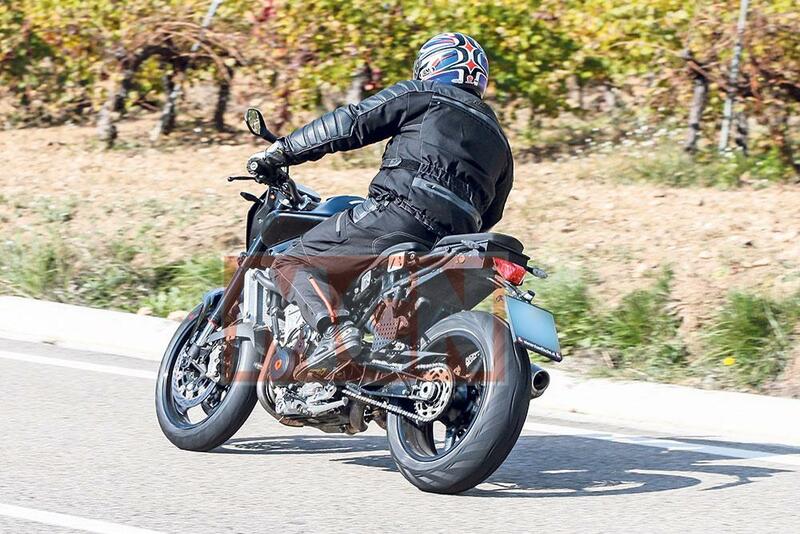 As with all KTMs the family is likely to comprise a naked 800 Duke (expected to be called the 790 or 890 Duke to keep it in line with the rest of the range), an adventure bike and maybe a GT too. This doesn’t even count the range of new models from sister firm Husqvarna, which will spawn from this engine and chassis platform. Right now we know for sure there are going to be two bikes based around the 800cc platform and that’s because KTM’s Director of International Sales and Marketing Hubert Trunkenpolz confirmed that information in a recent interview with MCN. While exact details of the new engine are still not known, we do know for sure the motor is a completely new parallel-twin design which has been created specifically for this range of bikes and shares barely a component with anything else in the range. MCN understands the engine will be close to 800cc to bridge the gap between the current 690cc single in the 690 Duke and the 1050cc V-twin in the 1050 Adventure. KTM know there is too large a gap between the 690cc and the larger-capacity bikes and, in order to continue the massive expansion of the company seen in the past few years, a middleweight capacity engine and chassis platform is essential. Parallel-twin engines have become increasingly popular in recent years for a series of reasons. They are cheap to produce and design, compact, fuel-efficient and also offer huge advantages in terms of packaging. MCN estimate this engine will likely produce around 75bhp to 80bhp and offer frugal economy too. It’s not just KTM who like the benefits of parallel-twin. Honda recently launched the new CRF1000L Africa Twin with a new 1000cc lump and true off-road ability. KTM’s decision to use a parallel-twin means it will be even easier to build up other types of bikes around the same powerplant – particularly an adventure bike. Slotting something like an 800cc parallel-twin into a mid-range adventure bike would make for a chassis and engine layout that would leave plenty of space for an airbox and a large fuel tank to be housed well out of the way from potential stone damage. Using a 270-degree firing order also boosts low-down torque and makes for more exciting performance. Yamaha have also joined the likes of BMW and Kawasaki in using modern, lightweight parallel-twins in recent years. As with many recent KTMs there is a huge amount of component sharing in evidence. Not only does sharing components speed up the development of the bikes but it massively reduces costs to build and develop new bikes. KTM are fast becoming the masters of ensuring each component is designed with the potential for it to be shared between multiple machines. KTM’s recent history has seen some frantic work and the firm have increased the number of permanent staff in their research and development arm to 370 as bosses attempt to increase the number of bikes KTM sell to more than half a million per year.